First Grade Kate: Let's Get Acquainted Linky! I have loved reading all of the "Let's Get Acquainted" posts from Latoya Reed over at "Flying into First", so I thought I'd join in the fun! Her topic this week is advice for new teachers. I am still new myself, my first year of teaching being only 2 years ago, so the successes, triumphs, and cringe-worthy moments are still fairly fresh in my mind. Without further ado....here it is! Buy a desk organizer! There is so much STUFF that gets handed out at meetings or dropped off in the middle of class, and so where else to put it but on the desk! My first year, I was lucky to even see my desk peeking out from the piles. A desk organizer for school supplies, files, papers, etc. can make your life a little easier! Never be afraid to ask for help! I was constantly going to my grade level colleagues and asking them questions my first year. They were super patient and helpful, and they really didn't mind me asking questions. They understood how hard it was to be a first year teacher, and they wanted to help me succeed. Teachers are in the business of helping, so don't be afraid to lean on your colleagues for advice and support! Speaking of leaning on colleagues, I really recommend finding a mentor to help you along. Some schools or districts automatically pair teachers up with a mentor, and sometimes it's up to the new teacher to find their own. I personally recommend connecting with someone who's in a similar teaching position as you (ie: teachers at similar grade levels, same subjects, etc. ), although a lot of good advice can still be gained from veteran teachers of any grade. Make sure you know your school's procedures and routines....because your kids will know them and they will know if you don't! Are there any special assemblies the first week? How do kids get to and from lunch, recess, etc? What are your school's dismissal procedures? Knowing these nitty-gritty items will help make your first few weeks a whole lot smoother! Be kind to yourself!! If you are like me, you are a perfectionist and want to do things right the first time. Unfortunately, teaching doesn't work that way! You will make mistakes, but that is OKAY! I am still learning this one right alongside y'all, but the important thing is to reflect on it (just for a little bit) and then use it to improve in the future. Thanks to Latoya for hosting this linky! I have enjoyed reflecting (again!) 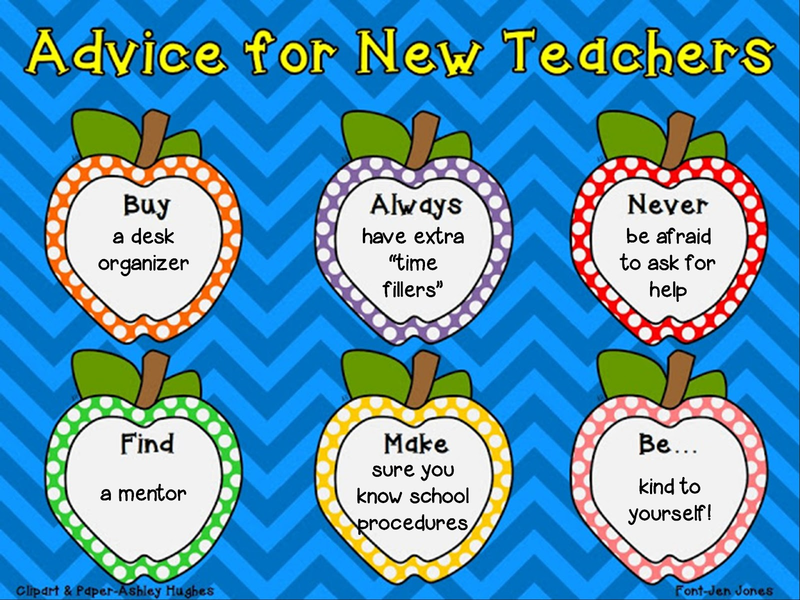 upon my own first year, and I hope that my advice is useful to any new teachers reading!